Pavement performance is a function of its relative ability to serve traffic over a period of time. Typically, a system of objective measurements is used to quantify a pavement's condition and performance. Establish maintenance priorities. Condition data such as roughness, surface distress, and deflection are used to establish the projects most in need of maintenance and rehabilitation. Once identified, the projects in the poorest condition are more closely evaluated to determine repair strategies. Determine maintenance and rehabilitation strategies. Data from surface distress surveys are used to develop an action plan on a year-to-year basis; i.e., which strategy (patching, BSTs, overlays, recycling, etc.) 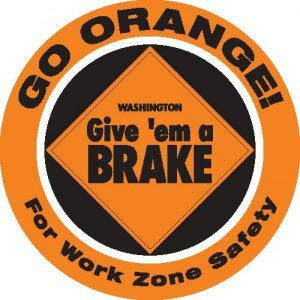 is most appropriate for a given pavement condition. 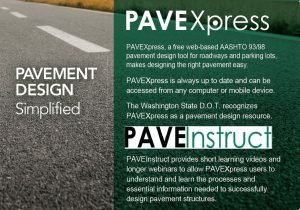 Predict pavement performance. Data, such as roughness, skid resistance, surface distress, or a combined rating, are projected into the future to assist in preparing long-range budgets or to estimate the condition of the pavements in a network given a fixed budget. Pavement roughness is an expression of irregularities in the pavement surface that adversely affect a vehicle's ride quality. Roughness is an important pavement characteristic because it affects not only ride quality but also vehicle operating costs, fuel consumption and maintenance costs. The World Bank found road roughness to be a primary factor in the analyses and trade-offs involving road quality vs. user cost (UMTRI 2010). WSDOT uses the international roughness index (IRI), developed by the World Bank in the 1980s, to quantify roughness. IRI is based on the accumulated suspension of a vehicle (inches or mm) divided by the distance traveled by the vehicle during the measurement (miles or kilometers). The open-ended IRI scale is shown in Figure 1. Roughness measurements can be made in a variety of ways including surveying instruments, portable inclinometers, profilographs, response type road roughness meters (RTRRMs) and profiling devices. The most common methods involve profilographs and profiling devices. 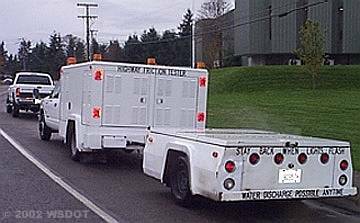 For pavement condition surveys, WSDOT makes roughness measurements using laser equipment mounted in their data distress collection van (Figure 2). 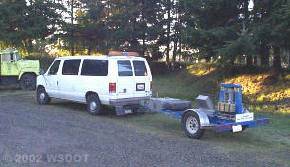 In addition to collecting IRI data, this van also records rutting and video images of the pavement surface, ahead view, and shoulder view. Fracture. This could be in the form of cracking or spalling resulting from such things as excessive loading, fatigue, thermal changes, stripping, slippage or contraction. Distortion. This is in the form of deformation, which can result from such things as excessive loading, creep, densification, consolidation, swelling, or frost action. Disintegration. This is in the form of stripping or raveling, which can result from such things as loss of bonding, chemical reactivity, traffic abrasion, aggregate degradation or binder aging. Thus, surface distress will be somewhat related to roughness (the more cracks, distortion and disintegration – the rougher the pavement will be) as well as structural integrity (surface distress can be a sign of impending or current structural problems). Surface distress measurement techniques are largely visual. Simpler, less expensive techniques, use individuals or teams of individuals to subjectively rate pavement sections based on observed distress. More advanced techniques record pavement surface video images at highway speed using high resolution cameras on a specially equipped van (Figure 2). Evaluation is either done manually by playing the video back on specially designed workstations while trained crews rate the recorded road surface or automatically by computer software. 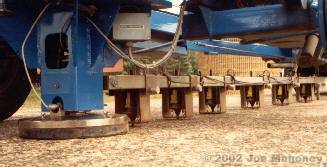 Skid resistance measurements can be used to evaluate various types of materials and construction practices. Skid resistance changes over time. Typically it increases in the first two years following construction as the asphalt binder is worn away by traffic, then decreases over the remaining pavement life as aggregates become more polished. Skid resistance is also typically higher in the fall and winter and lower in the spring and summer. This seasonal variation is quite significant and can severely skew skid resistance data if not properly compensated (Jayawickrama and Thomas 1998). WSDOT measures skid resistance using a locked-wheel skid tester (Figure 3), which basically employs a locked wheel skidding along a tested surface to measure friction resistance. The magnitude and shape of pavement deflection is a function of traffic (type and volume), pavement structural section, temperature affecting the pavement structure and moisture affecting the pavement structure. Thus, many characteristics of a HMA pavement can be determined by measuring its deflection in response to load. Surface deflection is measured as a pavement surface's vertical deflected distance as a result of an applied (either static or dynamic) load. The more advanced measurement devices record this vertical deflection in multiple locations, which provides a more complete characterization of pavement deflection. The area of pavement deflection under and near the load application is collectively known as the “deflection basin”. The most common type of measurement equipment in Washington is the falling weight deflectometer (FWD) ( Figures 4 and 5). The FWD can either be mounted in a vehicle or on a trailer and is equipped with a weight and several velocity transducer sensors. To perform a test, the vehicle is stopped and the loading plate (weight) is positioned over the desired location. The sensors are then lowered to the pavement surface, the weight is dropped, and the surrounding pavement vertical deflection is recorded.